Watersport at Benoa regularly beginning from 08:00 am, it is depend on the water circumstances. This watersport is usually accompany with experience instructors, they will guarantee your safety and security while doing this activity. To keep guest comfortable all Bali Water Sports Tour activities are ensured by high quality safety equipment and medical insurance. Just enjoy the exciting Bali Water Sports activities of your choice. Banana boat is very popular watersports activity in Bali islands. Banana boat is a long banana-shaped inflatable craft that you can sit on while being pulled by a speedboat. Expect wind in your hair, splashes of sea water, and loads of fun! This activity will bring you to the great experience by free run away on the seawater and pulled by the power boat. 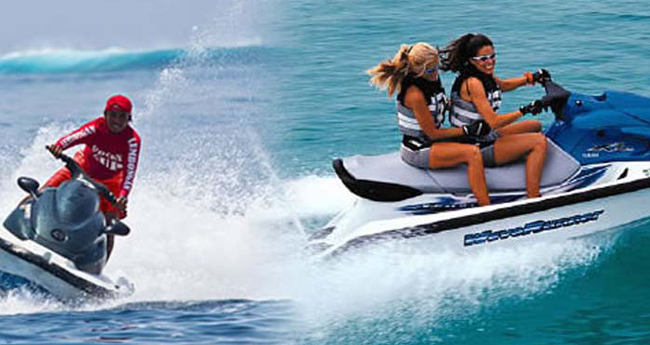 The high quality safety equipment of Water Sport, with the professional boat rider and experience Water sport guide instruction will ensure your adventures enjoyable one. The boat then drives off, carrying the parachute into the air. The parachute will be connected to a boat with a string rope. The rope is 120 meters long and you will be brought up to a height of 60 meters! Enjoy a panoramic view of the open skies and wide seas of Bali. Jet Ski is just like a motorcycle, the acceleration in a jet ski is provided by a hand powered throttle located on the right side grip. Be your own driver and speed along the waters of Benoa. For your safety a professional instructor will accompany you throughout the ride. Fly fish is the newest marine sport activity by riding a flat rubber boat which is pulled by a speed boat. It flies to dash against the wind sweeping that it real fly on the seawater. This watersports activity you will sit side of the tube fish and hold on tight and enjoy fly around tanjung benoa beach. The shape of a donut-like shape with Banana Boats just a lot like a donut, donut here can be played by 2 people and it depends on the speed boat on request. You will be rocked on a unique boat shaped like donut and drawn at full speed by a speed boat. The distance between inflatable rafts to speed boat is about five meters. For one round of this game lasts about 15 minutes. This is not suitable for pregnant women, people with asthma, heart and/or sinus problems. All participants will be required to complete a health questionnaire prior to activities. Ayung River Rafting is the best and the most popular White Water Rafting in Bali islands with rapids class 2-3 and very safe for beginner. 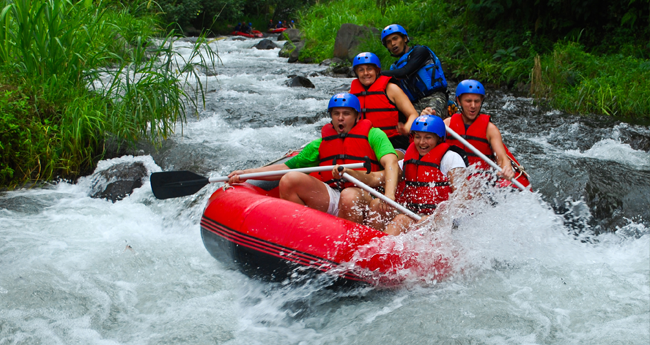 Ayung River Rafting located in Ubud Village takes around 1 hour from Denpasar, Kuta. Legian and Seminyak. The length of Ayung River is 11.0 kilometers or 7.0 miles. Ayung River is safe for beginner and also suitable for those never try the white water rafting before and Rafting at Ayung River is perfect adventure for your family. From here, you’ll set off on your 2,5 hours adventure, unique way to appreciate the natural scenery of Bali. Journeying down the Ayung river, you’ll see dramatic waterfalls, lush rainforest, high cliffs and breathtaking gorges during which you’ll get wet and wild! Your guides will make your experience even better by entertaining you with jokes and pointing out the different species of wildlife and exotic plants of the island, all while keeping your safety in mind. Out of the water when you finish the white water rafting adventure, soon you will be offered with long arrangement of buffet, which is all inclusive. As seeing across the rice fields and the Ayung River valley. Telaga Waja River is the best river rafting and the longest challenging rafting river, starts to runs southward Bali from southern slope of mount Abang. Mount Abang a peak at the south rim of Batur caldera as the remnant of tremendous eruption which was probably happened at the same time as other super volcanic eruptions along volcanic belt of archipelago. Our service will be to assist and accompany you to explore the beautiful panorama and the extreme currentof Telaga Waja river, Karangasem. This is completed 16 km distance in around 2.5 hours. 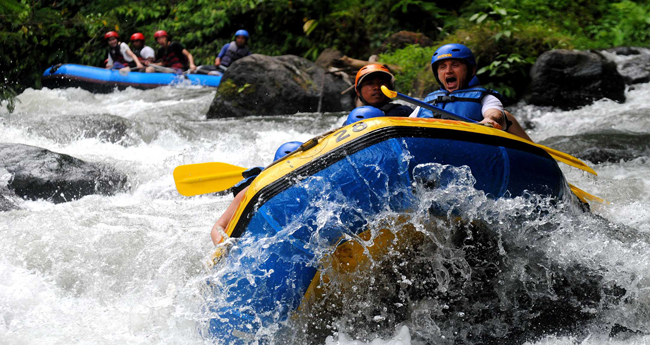 Telaga waja river is one of the amazing place for white water rafting in bali, it has the biggest rapids class (level 1 – 4) and longest rafting track (+ 15 km). To rafting down in this downhill is the most exciting part of rafting on the Telaga Waja River Rafting, Telaga Waja River also offers a view of unspoiled nature. At each edge of the Telaga Waja river is surrounded by rice fields, shrubs and trees. Not only the natural scenery, the fresh air around also an attraction at Telaga Waja rafting. Bali ATV Ride activity are daily trips, dry or raining season the activity challenge must go on, depend to your self preference. Our experience instructor will carry out a full safety briefing before riding through Balinese villages, crossing back road tracks, rice terrace fields and take in the breathtaking views. If it’s more of a challenge that you crave, our instructor will guide you through some of the most technical terrain our site has to offer, traverse seemingly impossible slopes, down hill and then use the full power of the bikes to ascend back to the up hill. Experience the excitement of riding a powerful semi automatic 250 cc ATV bike in central of the most stunning countryside Bali has to offer. 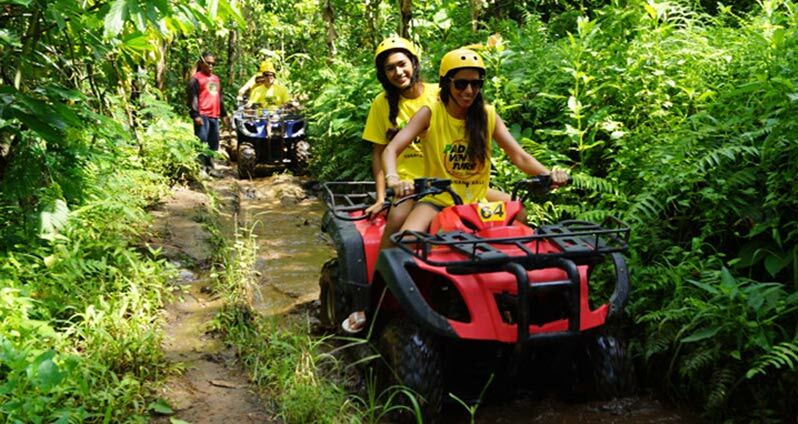 All of ATV Ride Tour activities are daily trips. Dry or raining season the ATV Ride Tour challenge must go on, depend to your self preference. ATV Program offers you a four-wheeled motorcycle ride with unforgettable experience and challenging adventure to accomplish including going through the winding, sloping down and upward routes. You’ll discover the awesome panoramic view of the rice fields before coming across a small part of the Bali Jungle.